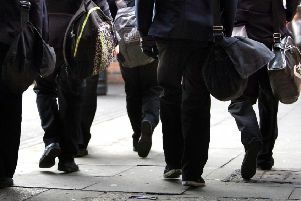 More than two thirds of schools in South Tyneside have been rated as "good" or "outstanding", according to new figures. Education watchdog Ofsted has released its annual report for 2017/18, which gives a pictures of the performance of early years, schools, further education and skills, and social care providers in England. Ofsted has released date for performance in schools. It found that 67% of secondary schools in the South Tyneside area are class as good or outstanding, which is 11% down on last year. The figure is higher than the North East average of 58% but below the England average of 75%. The number of South Tyneside primary schools rated as good or outstanding is at 89%, a fall of 9% on last year. The figure is just under the regional average of 90% but higher than the national average of 87%. And of the 8,431 pupils who attended secondary schools in South Tyneside in 2016/17, a total of 358 had one or more fixed period exclusion, a rate of 4.26%. The number of fixed period exclusions in secondary schools in South Tyneside was 721, which works out at 8.57%. The national average is 9.4%, compared to 12.9% for the North East. Councillor Moira Smith, lead member for children, young people and families at South Tyneside Council, said: “It is good news that 89 per cent of primary schools in South Tyneside have been rated as Good or Outstanding by Ofsted. “It is also positive that more than 77 per cent of all secondary pupils in South Tyneside are in schools which have been rated Good or Outstanding which is well ahead of the North East average.